For all of you with Android phones looking for eco-friendly apps, here is my top pick! As many of you know, the Monterey Bay Aquarium puts out a Seafood Watch list of sustainable fish choices when it comes to dining or shopping. I used to print and carry around the paper version, but the great thing about it is that it updates itself so you get the most up-to-date information on fisheries and status. 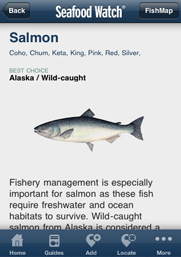 Details: Provides up-to-date information on sustainable seafood choices for dining or shopping in an easy to search or browse format. Plus there is so much more, with interesting facts, illustrations and more. This guides you with ratings of ‘Best Choice’, ‘Good Alternative’ and ‘Avoid’ so you can make the best decision for the planet and your health. Since many of these fisheries are contaminated with high levels of mercury, even the USDA recommends pregnant women avoid these fish. They also have a sushi guide, which lists common sushi and sashimi fish by their common and Japanese names to reduce any confusion. With detailed information and fun facts, you will also learn why it is listed in the category and find out some interesting things about its life cycle, behavior, and environment. 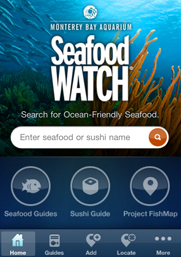 Even search local restaurants based on your location to find sustainable seafood options! Access to over 365 recommendations for seafood across the U.S., including the Great Lakes and Hawaii – automatically selected according to geo-location. A special guide for sushi lovers, including listings by Japanese names. Option to add new restaurants and markets to the FishMap database. Earn virtual badges for using Project FishMap and share sustainable seafood findings with friends via Facebook and Twitter. 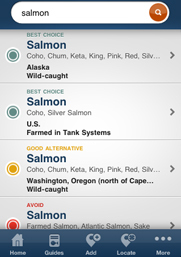 Search function to find seafood quickly and easily by common market names. Suggestions to sustainable alternatives for items on the Seafood Watch “Avoid” list. Find more green android apps or green iphone apps for your mobile device or smart phone.